With tribunal claims and awards rising quickly – the number of cases increased by 118% in the three months to the end of March 2018, compared to the same period last year – you need to be certain your managers are getting employee relations right. We can help you reduce risk, cost and resources at every stage. 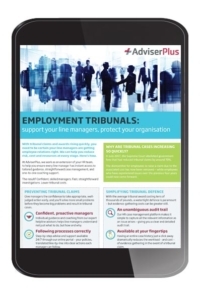 At AdviserPlus, we work as an extension of your HR team, to help you ensure every line manager has instant access to tailored guidance, straightforward case management, and one-to-one coaching support. The result? Confident, skilled managers. Fast, straightforward investigations. Lower tribunal costs.